Meanwhile, Splinter has experienced a disturbance in the force and suggest to the Turtles that they make haste to the Fine Arts Museum, where they follow Shredder back to the year 1583 – the year the Foot Clan came into being. Back in ancient Japan, Shredder storms the palace of Oroko Sancho and informs him that he is one of his descendents, Oroko Saki, and that he has traveled from the future to give him power and wealth beyond his wildest dreams. But after Shredder tells him about the location of two magical relics in the forest that would provide Oroko Sancho power and wealth, Shredder’s ancestor decides that he can find it for himself without the aid of his descendant. This proves to be his undoing, as Shredder decides to don Oroko Sancho’s battle armor, impersonating his arrogant ancestor, and lead his men into the forest. Meanwhile a young Samurai, named Hamato Koji, is also roaming the woods in search of something his sensei instructed him to find, in order to start his own ninja clan. Back in ancient Japan, Splinter and the Turtles arrive just in time to help Koji defend himself against Shredder and Oroko Sancho’s men, who have been ordered to kill Koji before he locates that which he needs to create what will become the Foot Clan. Needless to say Shredder is extremely angry that the Turtles have followed him to the past and threatens that they will never escape the past without the Time Machine Remote Control. Before they can pursue Shredder and get the remote they must assist Koji in his quest (and naturally, explain who they are and why they are there). Meanwhile, Shredder must hire new assassins to deal with Koji, Splinter and the Turtles, now that Oroko Sancho’s men refuse to fight because they believe that Splinter and the Turtles are Tengus – demons. 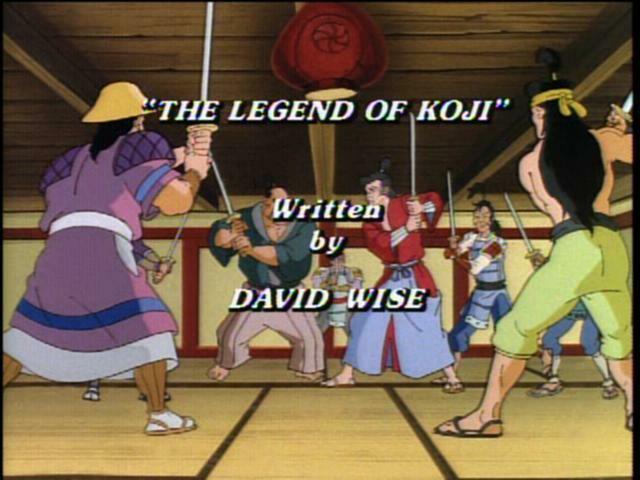 After defeating another hired killer, Koji, Splinter and the Turtles discover the location of the Shibano Sama shrine. Inside they discover the Nomi sword, a legendary blade that can cut through anything, and the Tsunami Box, containing a power greater than any tidal wave. Koji attempts to open the box, but is warned by Splinter that it should only be opened when it is truly needed. No sooner does Kohji have these magical relics in his possession does he begin to dream about the power of his clan, then they find themselves surrounded by Shredder and his samurais. During their battle the Tsunami Box is accidentally opened, releasing a giant fire-breathing dragon which, after scaring everyone, heads in the direction of a nearby village. So while Koji and Splinter go off to protect the village, the Turtles are left to keep Shredder and the marauding samurais at bay. Oroko Sancho manages to free himself and declare Shredder as an imposter. Just as his samurais are about to execute Shredder and the Turtles, Koji arrives riding atop the now tamed dragon. Oroko Sansho cowers in fear, revealing his true colors. Koji offers service to Oroko’s men as he initiates the Foot Clan. Once again, Shredder’s brilliant plan is foiled as Donatello uses Shredder’s remote to transport the other three Turtles, Splinter and Shredder back to their own time.